Napoleon Gomez Urrutia is President of the National Mine, Metal, and Steel Workers Union of Mexico. 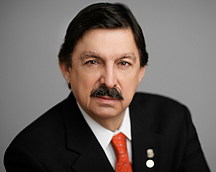 Napoleon Gomez Urrutia has served as president and general secretary of the National Mine, Metal, and Steel Workers Union of Mexico. Since his unanimous election in 2002, he has been reelected six times consecutively. He is an Oxford-educated economist and also a member of the international executive committee of IndustriALL Global Union, the world’s most powerful union organization. He works closely with leaders of unions around the world, including the United Steelworkers Union of North America. Columnist of La Jornada, the most important Mexican independent newspaper. Life member of Wadham College Society, Oxford University. International lecturer. Reading and writing, music, arts, movies, theatre, economics, history, politics, international relations, hiking, walking, baseball, tennis, american football, outdoor animal watching.